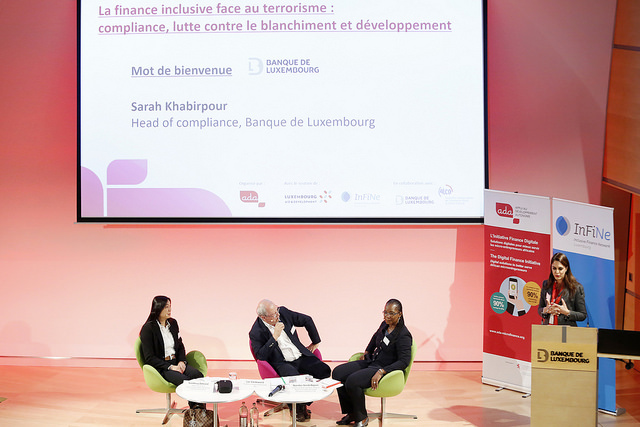 Nearly 100 people attended the last Midi de la microfinance on inclusive finance versus terrorism: compliance, anti-money laundering and development and the discussion between Ms Sundhevy Debrand, ALCO member and Compliance Officer at Quilvest Luxembourg Services SA and Ms Azaratou Sondo, Deputy Director in charge of the Network at the Faîtière des Caisses Populaires du Burkina Faso (FCPB). Luc Vandeweerd, Board member of ADA and InFiNe.lu, moderated the debate. « Customers, investors, people with whom we have a business relationship… you have to know who you are working with before you can make transactions ». This is how Sundhevy Debrand sets the context. The transfer of funds from Luxembourg to different countries is highly regulated by European anti-money laundering directives transposed to Luxembourg, which also include the list of high-risk countries classified by the Financial Action Task Force (FATF), an intergovernmental organisation fighting money laundering and terrorist financing. Mrs. Debrand continues: « With this list, the Luxembourg government has not taken a position; it is up to each professional in the financial sector to make its own risk-based approach, based on its own knowledge of the legal and regulatory framework of the country with which it will work. However, we know that in finance, there is no such thing as zero risk. However, it is possible to reduce the risk after two or three years of working with a country, when you know its local specificities well. Our role as compliance officer is to control the transfer of funds to these countries, and this control depends above all on knowing the client« . Regulations application in the field,but at what cost ? Luc Vandeweerd adressed the question on how these regulations are perceived in Burkina Faso. For Azaratou Sondo, « Since the creation of our umbrella company in 1972 to this day, the regulation has undergone a major evolution. We are now subject to instructions from the Central Bank and it is becoming increasingly difficult to carry out large volume transactions. We are required to report any transaction over CFAF 5 million – approximately €7,500 -. This permanent control can destabilize the customer and even damage our reputation« . While the binding aspect of compliance is highlighted in administrative terms, its cost does not facilitate its implementation either. « The cost of compliance is expensive« , says Debrand. So who is responsible for this? « A field visit is at the institution’s expense and can quickly reach significant amounts depending on the cost of the inspection and the financial sanctions applied, if any, continues Mrs. Debrand. « Personally, we have to deal with it, replied Azaratou Sondo. Supporting the cost of compliance means setting up structures to absorb these costs, because we cannot charge this to our members ». Northeastern Burkina Faso faces terrorism and insecurity prevails and loan officers can no longer even travel to villages to meet members. So how can we continue to provide services in these fragile areas? « The solution is digital finance, says Mrs. Sondo. A national strategy is being developed to enable us to transfer money securely while pursuing our mission of poverty eradication. I am hopeful« . Raymond Schadeck, President of Investing for Development SICAV – Luxembourg Microfinance Development Fund provided the closing remarks. While for him compliance with European and Luxembourg legislation is very important, it obviously does not solve all the problems on the ground. « You have to do a good assessment between the risk and what you’re trying to achieve, » he adds. And above all, you need to surround yourself with partners who know the market well and who have the means to do the job. LMDF has been operating with ADA for 9 years. Together, they have created 115 partnerships in 26 countries. It is through a strong partnership that we will succeed not in avoiding the problem, but at least in preventing it ».According to Mr. Schadeck, microfinance institutions need to invest even more money, to better inform the public and their investors about the impact they are creating. « Talking about risk is important; but you have to balance all that; in 9 years, LMDF has disbursed 150,000 loans, which means they have changed the lives of 150,000 households! ».